O Allaah I request of You with Your knowledge, and by Your Power I seek capability, and I ask of you of your great favour, since indeed You are the One who is able while I am not, and You know and I do not, and You are the One who knows the unseen. O Allaah if You know that this matter – here he mentions his need - is good for me in this world and for my living and for the matters of my Hereafter – or he said, for my affairs now and the future – then decree it for me and make it easy for me and bless it for me. And if You know that this matter is evil for me in this world and for my life and for the matters of my Hereafter – or he said, for my affairs now and the affairs of my future – then turn it away from me and turn me away from it, and decree goodness for me where ever it may be and make me pleased with it. ‘Allaah compensated the Muslims by giving them this supplication, which isTawheed, and it is being in need of Allaah, servitude of worship, reliance upon Allaah, asking the One in whose Hand is all goodness, Who Alone can turn away evil. ‘Indeed the human being has been created weak, and is in need of Allaah -Ta'ala- in all his matters and that is because a human does not know from where good and evil will occur in the future from incidents and events. This is why, from the Wisdom of Allaah - Subhanahu - and from His Mercy to His slaves, He legislated for them this Dua’ so that they can come closer to their Lord and that they can seek refuge with Him, and that He will direct them to the path leading towards good and benefits. Indeed the Muslim slave of Allaah is upon certainty in which there is no doubt that the management of all matters and the execution of them is in the Hand of Allaah -Subhanahu wa Ta'ala - and He is the One who destines and executes whatever He wills in His creation. ‘That al-Istikharah is not done when a person is uncertain about the matter at hand; because the Prophet -sallAllaahu alayhi wa sallam- said: ‘If any of you intends to undertake a matter’ and that the whole of the Dua’ indicates to this point. 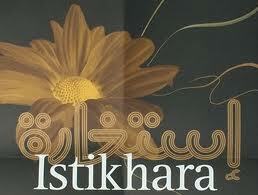 5 - What should be done after al-Istikharah? ‘Likewise, there is nothing in the narrations mentioning sleep after al-Istikharahprayer or recognizing that which is better for that person of what he may see in a dream.